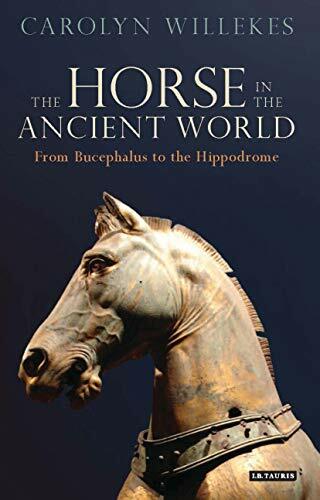 Bucephalus was Alexander the Great’s horse and is considered by some to be the most famous horse in history. Alexander and Bucephalus’ initial meeting was unique but demonstrated the true character of one of the greatest generals in all of history. Initially, Bucephalus was brought to Macedonia and presented to King Phillip II (Alexander’s father) in 346 BCE by Philoneicus of Thessaly. With a price tag almost three times the norm (13 talents), the beautiful black horse stood taller than the normal Macedonian steed but was considered too wild and unmanageable, rearing up against anyone who came near him. Phillip ordered him led away. Alexander sat in the audience with his mother Olympias watching the spectacle before him. As the attendants tried to lead Bucephalus away, Alexander rose, calling them spineless. According to Plutarch’s biography of Alexander, the young prince said, “What an excellent horse do they lose for want of address and boldness to manage him.” At first Phillip ignored the challenge, but finally said to Alexander, “Do you reproach those who are older than yourself, as if you were better able to manage him than they.” Alexander, ignoring his father remark, repeated his challenge and said he would pay for the horse if he, Alexander, were unable to tame him. Bucephalus and Alexander were inseparable; only Alexander could ride him. Amid wild laughter, Alexander approached the horse he would name Bucephalus calmly. He had realized something the others had not - the horse was afraid of his own shadow. Turning Bucephalus toward the sun so his shadow was behind him and slowing taking the reins in his hand, Alexander mounted him. The laughter of the crowd turned to cheers as Alexander rode off. Although historians disagree on the cause of the horse’s death - some claim he died from battle wounds - most agree he died of old age after the Battle of Hydaspes River (326 BCE). While Plutarch spoke of both possible causes of death, he cites Onesicritus, a historian who accompanied Alexander on his conquests, as stating the horse died of old age. However Bucephalus died, in mourning, Alexander founded a city in his beloved horse’s memory and named it Bucephala. It is also interesting that Alexander built another city after his favorite dog Peritas. Cantor, N.F. Alexander the Great. (Harper Books, 2005), 39 -40. MacLean Rogers, G. Alexander. (Random House Trade Paperbacks, 2005), 137-138. Plutarch. The Life of Alexander the Great. Rice, E.E. Alexander the Great. (Sutton Publishing, 1997), 15 -17. Wasson, Donald L. "Bucephalus." Ancient History Encyclopedia. Last modified October 06, 2011. https://www.ancient.eu/Bucephalus/. Wasson, Donald L. "Bucephalus." Ancient History Encyclopedia. Ancient History Encyclopedia, 06 Oct 2011. Web. 24 Apr 2019. Written by Donald L. Wasson, published on 06 October 2011 under the following license: Creative Commons: Attribution-NonCommercial-ShareAlike. This license lets others remix, tweak, and build upon this content non-commercially, as long as they credit the author and license their new creations under the identical terms. Please note that content linked from this page may have different licensing terms. Possible birth year of Bucephalus.